Living in the country, we are surrounded by farms, alpaca, and dairy, beef and horses for the most part. In 22 years, I had never seen a pig farm. In the past we’d seen farm fences cut and damaged by deer. Neighbors’ farm animals would get into the road, often with disastrous results. My first thought when Jaden called was to make sure no one got hurt. And in my mind I was imagining a small pig, maybe 50 lbs. So I proceeded to give instructions over the phone to my boys on how to catch the pig. 15 minutes later I got a call from a very annoyed, very indignant, 12 year old. “Mom, Uncle Butch said that pig is wild, and he has been in the wild for a long time, and he is probably 400 lbs, and he is very mean, and I should stay away from it, as far as I can! Now do you know why I was so scared?! !” At this point I was thinking Social Services would be coming to take away my children because I had them sacrifice their safety for a wild pig. I locked up our dogs and proceeded to sneak around the front of the house. This massive black and white pig was now under the apple tree reaching as high as he could to try to get an apple off the tree. As soon as he saw me, he bolted. But he didn’t go far. He was really hungry and he wanted those apples. So we mobilized as a team. Jaden snuck around the yard and locked the gate on the far side of the horse arena. Tim and Noah formed a human fence between our barn and our wildlife clinic. They were going to have to keep the pig from running out to the woods again. And I started pulling apples off the tree and packing them into my shirt. The pig was afraid, but he was watching me carefully. It was obvious that he really wanted some food. So I started lobbing the apples over his head in the direction of the horse arena. As I did that he would run to the apple and eat it and then turn back and look for a place to escape. I’d take a few more steps towards him and throw another one. If he hadn’t been so hungry we never would have caught him. Finally after about 5 apples he was inside the horse arena and Tim locked the gate. Immediately the poor frightened pig started tearing around the arena in an attempt to get away. He was frantic with fear, but he was also still hungry. So when he stopped to catch his breath I’d toss him and apple and talk to him. He’d find it and eat it and listen. I sat with him for the next several hours against the fence and each time I tossed the apples just a little bit closer to me. He gradually moved closer each time until he was standing next to me on the inside of the fence. I reached out to him very slowly and touched his neck he flinched and snorted really loudly, but he didn’t run away. He was starting to get curious about me. His size was extremely intimidating and his head was just massive, not to mention the tusks. He was quite a sight. As I was looking him over I quickly noticed the scars he had accumulated while he had been in the wild. There were several old ones and they had scabbed over. A long deep scar down the length of his back told me he had probably tried to run under a barbed wire fence. This boy had been through a lot since he escaped. He was in rough shape. Knowing what happened when cuts heal, I decided to see if his scars were itchy. As soon as I scratched one on his neck, he immediately leaned into my hand and groaned. It must have felt so good to finally be able to itch a spot he couldn’t reach for weeks. He was in heaven. That’s when I knew I had him. I spent several hours with him that night just getting him comfortable with my voice and my touch. Tim, Jaden and Noah all did the same. Over the next several days, the boys would get off the bus after school and the first thing they did was pull apples from the tree and feed the pig. By the end of the week he was running to the fence when he heard the sound of the bus. Pigs are very intelligent and he learned very quickly that the four of us were not going to hurt him. We always brought him something he would like; apples, grain, water, a brush to itch his itchy spots. We were able to coax him into a stall in the barn a few nights later. We figured out pretty quickly that our pig had very poor eyesight. He would startle and bolt if we didn’t first introduce ourselves by talking to him as we were entering the barn. His hearing was excellent and his nose was always working. He loved to talk to us when we came in the barn and his voice was so loud it echoed off the barn walls. You see, what he liked most of all was company. We knew nothing about pigs, so the internet became our source for information. The problem, we found, was that the internet references were all about pigs being raised for meat. Correct weight, best food, medical care, vaccinations, were all based on getting a pig fat enough to slaughter as quickly as possible. So we had to improvise. We learned his food choices over the next several weeks. He loved apples and grain, leftover bread and even spaghetti were a treat. But he wasn’t crazy about green peppers. He’d push those to the side. We got him started on a commercial pig grain and he loved it. We were having a really good time with him and we were all falling in love with him. The trouble came when the neighbors told me the pig was probably an escapee from a farm a few miles from our house. He had been loose for several months in the neighborhood and many neighbors had guns ready. There was a sort of bounty on his head. People wanted to shoot the pig and put him in their freezers. 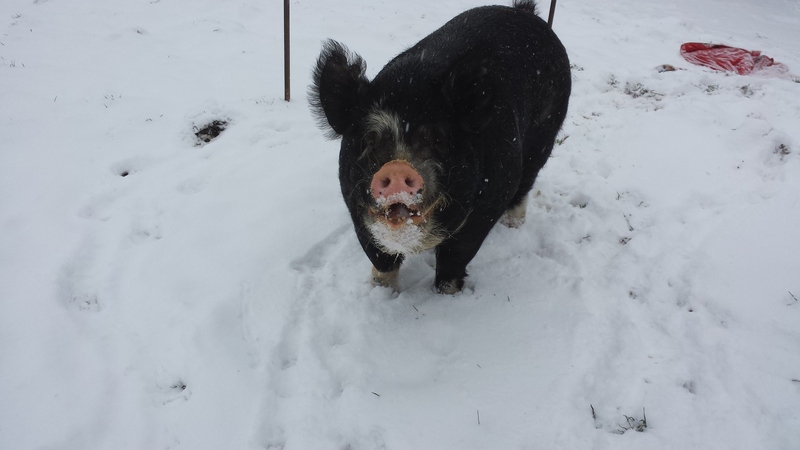 I was told that the farmer who may have owned him, had been notified several times by our neighbors that the pig was on their property, but he never came for the pig. I drove by the farm one night. There was a for-sale sign on the front lawn and there were police cars in the driveway. Apparently there was some domestic dispute, so I just left. I wasn’t going to send him back anyway so there was no point stopping. Some of our neighbors were unhappy with us for capturing the pig. It was as though they thought we were stealing him from their dinner tables. I saw it another way. We didn’t go looking for the pig. God brought the pig to us. The pig had survived for months in the wild. He could have been shot at any time during those long months, but God had other plans for this pig. He kept him safe until he found his way to our house. In my heart I knew that this very special pig was going to touch people’s lives. And he did. Tim, my husband, of almost 26 years, is a saint. He has put up with me and my crazy lifestyle for all that time and he’s done it with quiet resolution. He has never questioned my judgement where the animals were concerned and he has never told me I couldn’t do something when it came to saving an animal. But this time he was adamant, “We are not keeping the pig. Idraw the line at livestock.” I knew where he was coming from. In the 28 years I have known him, I have subjected him to so many animals and the expense of their rescue, but even worse, the heartbreak when we lost them. We had just suffered the loss of two of our beloved dogs to cancer, less than a month apart. We were all still heartbroken and healing. Because I also knew the pig was in danger of someone coming for him, I knew I had to find a home for the pig. One morning, I was getting ready for work. Our dogs were going crazy in the house barking at all of the windows. I looked outside and Oscar was loose. I was terrified. Would he run away, now that he’d had freedom again? I armed myself with cookies and apples thinking he would need to be tricked into the barn again. But, when I went out the back door, there he was sitting like a dog on the driveway looking up at the back porch. I said hi to him and he started grunting very loudly. He wanted his breakfast and I apparently had not produced it quickly enough. I walked to the barn with a very impatient pig marching alongside of me. He went right into his stall and had his breakfast. He would have to stay locked in there for the day until Tim could find the break in the fence. The crisis was averted and I knew then that given the choice, Oscar liked life in captivity better than life in the wild. It comes as a surprise to most people, that I’m a carnivore. I don’t eat a lot of meat, but it is how I was raised. I’ve always lived in farm communities. Raising livestock is a way of life here. But you won’t find a factory farm in our area. The livestock are all free ranging. Most of the farmers I know are decent hard working people who would do anything to help a neighbor. I do, however, have several dear friends who are vegetarian and vegan so I am aware of the alternatives to eating meat. With their help, I’ve tried some of the different vegetarian options to meat. Some I like very much. Although I have to admit, when I tried to do veggie burgers on a grill, they turned out like hockey pucks. They were awful, but it wasn’t their fault. You see, while I can cook Italian food, and maybe a few other things, I use my stove primarily as a nightlight and a clock. A funny thing happened the first night I spent with Oscar in the barn. We were having Italian sausage for dinner. It’s a family favorite. I’ve cooked it a hundred times. But on that night, after spending time with Oscar, when I sat down to supper, I couldn’t put the sausage in my mouth. Every time I tried, I gagged. 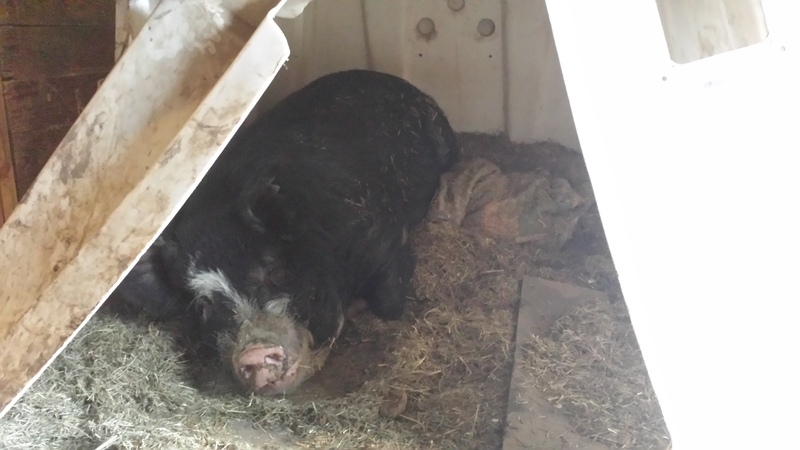 The problem: pork now had a name, and it was in our barn, asleep on the hay. Long story short, I haven’t eaten pork since he arrived. I’ve been collecting vegetarian recipes from all of my friends ever since. I won’t force vegetarianism on my family. I’ll let them make that choice on their own. But I doubt I will ever be able to eat pork again. I have had other meat since then, but no pork… baby steps. By the end of September, Oscar was doing well. He was clean. His wounds were treated. He was given a baby pool to bathe in. He was brushed and pampered every day. We were having a lot of fun with him, and growing very attached. But I knew he was not safe. We had to find him a permanent home, and quickly. I didn’t want to have any battles with neighbors and I didn’t want to worry every time I left the house that he might be harmed. I contacted several “farm sanctuaries.” Some of them were legitimate and others, not so much. It was obvious, that some wanted Oscar more for his fund-raising value than to give him a safe permanent home. These facilities had no proper way to house him and were completely unprepared to meet his needs. I needed a facility where the people had both their hearts and their heads in the right place where Oscar was concerned. Through a trusted friend of a trusted friend, I found a facility in downstate NY. Several phone conversations with the care takers and I knew I had found the perfect place for our boy. Now we had to work out the logistics of moving a very large pig across the state. Tim and I had already known we would, eventually, have to get Oscar on a trailer to transport him. You don’t put a 400 lb pig in the back of your SUV. We had already had trailer lessons with Oscar and he was getting on and off our horse trailer with ease as long as there were apples and he was hungry. Another consideration was that Oscar had to be neutered. As much as everyone loves baby pigs, Oscar could not be making more babies at a sanctuary. Pigs are normally castrated shortly after birth, using no anesthesia. Oscar didn’t have that option. We found out that pigs do not respond well to anesthesia. It is extremely dangerous for them, especially considering Oscar’s size. So our only option was to take Oscar to my old alma mater, Cornell. Noah joked that Oscar was going to get to go to an Ivy League School before he would. I made an appointment with the Cornell School of Veterinary Medicine, Equine and Large Animal Clinic. Oscar was on his way. The only drawback was that Oscar had to be dropped off the night before his surgery and he couldn’t be picked up until the day after, when he was out of danger from the effects of the anesthesia. So it was going to be a three day affair. Tim and I had to take time off of work to get him there. At work when I asked for my PTO (paid time off) to take a pig to Cornell, my boss just laughed. Two weeks before, I took PTO to help do veterinary physicals on our two rescued Bald Eagles who now live at the Buffalo Zoo. 4 days before Oscar was scheduled to go to Cornell, we had a situation. I had already been advised that no one could legally take Oscar from us after he had been loose for several months. Several attempts had been made to notify the farmer who might have owned the pig, of the pig’s whereabouts and they had gone unanswered. 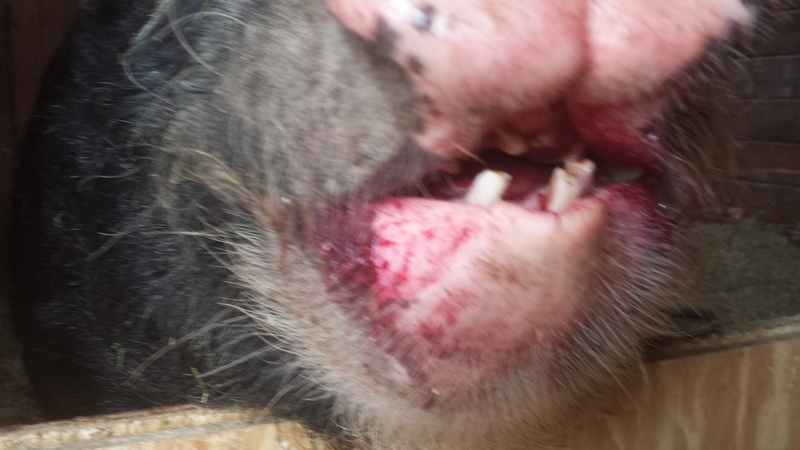 But never the less, I didn’t want to have to argue with a farmer about killing this pig. It was not going to happen. So we just decided to lay low until it was time for him to go to his new home. So on the Sunday before Oscar was to leave, when a car pulled up into the drive way, my heart was in my throat. I was visiting with company in the back yard. I wasn’t expecting anyone, and for some reason, I instantly knew what it was about. I sent the kids into the house. You know real fear when your chest hurts from beating so hard, and so loud, that you can hear it in your ears. Tim was mowing the lawn. Our dogs were barking like crazy inside their fence because the strange SUV had pulled into the drive way. The big barn door was open and Oscar was in his stall asleep. I prayed to God with everything I had that he would stay there. I had become a politician. They drove away very slowly, checking out our horse pasture and arena as they went. All the while I’m praying, “stay in the barn pig, please stay in the barn.” Once the SUV was all the way down the road, as I was breathing a sigh of relief, didn’t that crazy pig come marching out of the barn all ‘Hakuna Matata!” I was panicking, our company was laughing, and that pig was just marching away, not a care in the world! 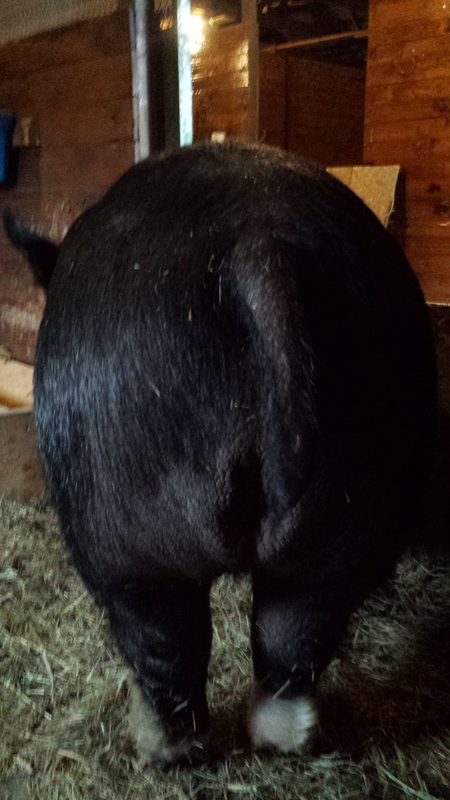 I finally coaxed the pig back into the barn with some grain and closed him in his stall. I ran to Tim on the tractor and told him “We have to move the pig now. Someone just came looking for him.” Tim is a quiet guy by nature. He’s the calmest guy I know. Nothing fazes him. Well, he wasn’t that night. He showed just how much he liked that pig when he shot off the lawn mower and pulled the truck and horse trailer into the horse arena in 2 minutes flat. I’d never seen him move so fast. Unfortunately the pig was not real hungry anymore because I used food to coax him back into the barn and he wasn’t real keen on getting into the trailer just then. I knew time was not on our side so I pleaded, and scratched his ears, rubbed his tummy, and pushed his bum, everything else I could think of. He wasn’t budging. I finally dropped to my knees, in tears, and I begged him. “Please, we’re trying to save your life. You need to work with me here buddy.” Oscar got the message somehow and he finally decided there must have been a good reason I wanted him on the trailer so he hopped up. Tim shut us both in. “Huh?” The confused look on Oscar’s face when he heard the door close was actually pretty funny. Then I think he smirked at me. By the time we got him secured in the trailer it was pitch dark outside. Tim and I hopped into the truck and took off out of the pasture and out of the driveway in a hurry. Tim looked at me kind of breathless and said, “Ok, where are we going?” As I was frantically texting every animal lover I knew, all I could say was, “I’m not sure yet, just drive!” And he did. We weren’t quite out of the woods though. Once we got to the safe house we still had to get Oscar to leave the trailer in the dark. He had to walk into a strange barn with strange animals around who all wanted to check out the short, chubby, dude with the funny grunting voice. There were geese, a horse, mini donkeys, two Mastiffs and maybe a partridge in a pear tree. I’m not sure. It took us an hour or so of coaxing, but we finally got him safely in his stall at the safe house. We joked that he was in the witness protection program. Four days later Oscar made it to Cornell. Tim, Ben, our St. Bernard rescue, and I, stayed in a hotel and toured the campus while we waited for him to have his surgery. The veterinarians and vet students fell in love with him. On his discharge papers they called him a sweet, gentle pig. The papers also said we were wrong about his weight. He wasn’t 400 lbs. He was a whopping 573 lbs 3 oz. In the words of a famous spider, that was some pig! When we picked him up he was very groggy and a little out of it, but the vet said he was safe to travel. So we drove the extra 3 hours east and arrived at his new home. He walked right off the trailer and into his new stall in his new barn. It was as if he knew he was finally safe and home. He greeted his new girlfriend for just a minute through the fence and walked around just a bit, but he was very tired so he laid down in the stall and fell asleep. He had had a really rough couple of days and he needed to rest. His new moms are wonderful people. They instantly fell in love with him and made it their mission to make him feel welcome and comfortable. Knowing I was worried about him they have been sending me updates regularly. By all accounts he is doing very well. I can’t thank everyone who was involved in Oscar’s rescue enough for everything they did to help us get this big gentle giant to a wonderful permanent home. No one ever rescues alone. So many people gave of their time and money to help with Oscar. I’m afraid if I tried to list them all I would miss someone. (That, and we’d all go to jail together.) Please, just know how much I appreciate everything you have done. And finally my family, they are terrific. My children grew up surrounded by animals. They have shared my time, from the day they were born, with one rescue or another. And they never complain. They knew this pig needed to be rescued. They never questioned me when I asked them for help catching him and for caring for him. They are incredible boys and I am so proud to be their mom. My husband Tim, what can I say? There are no words to thank a guy for nearly 30 years of caring and supporting me in every single rescue. There just aren’t. If you ever get to meet him, shake his hand because, without my friends and my children, I couldn’t rescue nearly as many animals, but without my husband Tim, I couldn’t do it at all. We love you Oscar and we miss you.